ever way ya got here thanx for droppin' in ! Please leave comments on the guestbook ! Sign the guest book to be eligible for discounts and free giveaways ! It was Memphis ... 1987 and I am in a shower with a four track Tascam 244. Four hours of writing lyrics later with the help two great "gitar" players adding their guitar parts ... combined with a couple of fifths of Jack Daniels, various medicinal smoking substances and some white powder when Mountain Man Moon Martin was born w/ yours truly on vocals, drums, bass, and harmonica. It actually was just a break in between writing serious songs (and demoing them on the TASCAM) for the my 2nd RCA record. Alotta RCA history buried in those lyrics and I gotta say there are a lotta truisms in the story ... going to Hollywood as a youngman blah, blah blah. . Thought the recording was lost forever ... finally found a copy in the closet ... where possibly it should have remained with the empty 5ths of JACK, strange smelling pipe, and well scraped mirror. 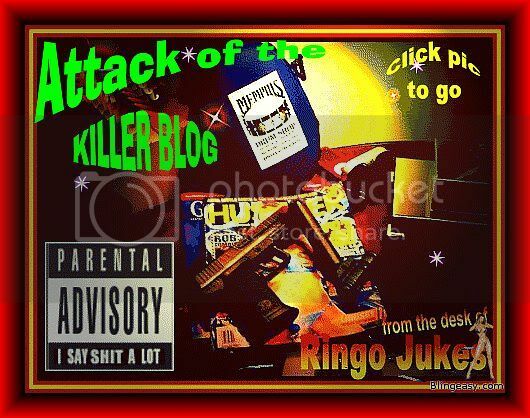 Back in '87 tthe song had became a small underground late night "on the way to the bar cassette" that many of my friends hadand over the years has I have dug up more of them thru the net ... there have been more in more inquires. The Boys from Bucksnort draw heavily on many different musical styles. The main emphasis is on 20's and 30's music with a touch of 70's, but influences from other eras are in the music as well. Blues, Ragtime, Rockabilly, Boogie, Irish, Folk, Gypsy, Hillbilly -- anything is fair game. But don't let this scare you off, this band rocks! The energy levels of the live shows make it really hard to hold still. 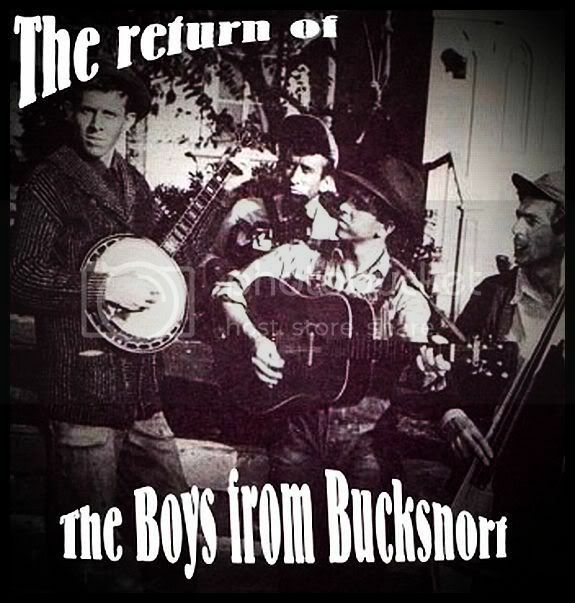 Although the Boys from Bucksnort formed in 1987, the history of the band goes back much further. Drummer Dufus Thomas (famous for the song Walkin the Hog") and guitarist Shakey Sliim Walker along with harmonica player Blow Hardy and bassist Mad "tub" Jones formed The Travelin Snakeheads in 1975. The Band became a staple in the Southern scene with their straight-ahead homemade styles. They opened shows for people like Charley Musslewhite, Little Charley and the Nightcats, and Charles Brown. In 1979, the band felt it had run it's course and disbanded. In the interim, guitarist Shakey Walker began getting interested in Ragtime and it's influence on the Piedmont guitar styles of Blind Blake, Blind Boy Fuller, and Blind Willie McTell through a chance meeting with legendary MOUNTAIN MAN MOON MARTIN ... who they soon added on vocals and spoons. 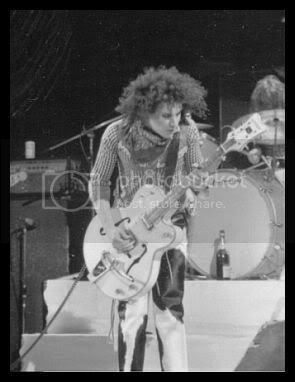 So in 1985, Shakey convinced his former bassist Tub Jones and drummer D Thomas to form The Boys from Bucksnort with MOUNTAIN MAN MOON MARTIN. Although they were skeptical at first, as the style developed, it was obvious they were on to something. The Band also released a cassette in 1980, titled "American Fork Music". They became regulars in the Bucksnort live music scene. They have opened shows for people ranging from Chicago Blues Guitarist Luther Jr. Johnson to the rock bands like Dash Rip Rock. The band released its first CD, in June of 1981 to a lot of anxious fans. The CD received great reviews and radio play all over the world. Their second CD, Too Tight, was released in April of 1984. It also received great reviews and lots of radio play. 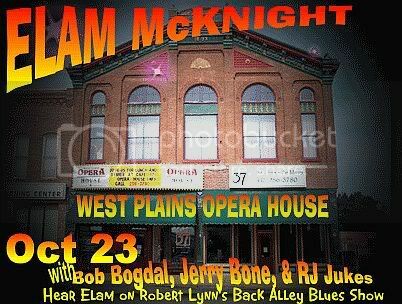 Since then the band has opened for guitar slingers Johnny Winter and Bugs Henderson and roots bands like The Paladins, Deke Dickerson, Kim Lenz and Her Jaguars, and Southern Culture on the Skids. The current lineup consists of Skakey Walker on Guitar and Vocals, Dufus Thomas on Drums, Shane Stewart on Bass, and just about anybody who happens to drop by the bandhouse. The band's infulences have continued to expand into all sorts of roots music -- from Gypsy, to Celtic, to Hillbilly -- but the band really rocks -- no cookie cutter stuff. The band released their third CD ... finest ingredients, in November of 1986 after MOUNTAIN MAN MOON MARTIN's girlfriend ... Tracy Fords left him for a traveling rock and roll outfit. Heart broken and down in the dumps. Mountain Man headed out ta find Tracy in the glam tattered streets of Los Angeles, taking his guitar and Tascam multi track 244 recorder in tow with him. The result was a collection of pinable tunage intitled the Return of the Boys from Bucksnort. The disc charted in February and March of 1987 on the Freeform American Roots Chart. The band is playing shows regularly in Bucksnort Senior Center, and doing some limited touring in the US. "It's highly academic and fascinating." - Thomas Conner -- some guy who watched "O Brother Where Art thou"
THE BOYS FROM BUCKSNORT featuring MOUNTAIN MAN MOON MARTIN !!! I was at Cold Springs, down on the Spring River, when I saw my first one. My son saw it, too. You may have noticed a few yourself—springing up along the river. "Dad, what is that?" he inquired, pointing to a strange-looking contraption which had only recently appeared on the old bridge. I looked up at the bizarre apparatus. All I knew was that it had never been here before. Having no idea what to reply, I worked my way out of my son’s question by joking, "Why, that’s an intergalactic communications device placed here by the aliens who live at the bottom of the river. They use it to phone home." He didn’t buy into it. In reality, I had no idea what this antenna-bearing, solar panel-wearing, hi-tech thingamajig was. Later that day, crossing the old Cold Springs bridge, I found another one. This time I stopped to read the information on the back. It stated, "USGS," which sounded pretty official to me... so I wasted no time in moving on. 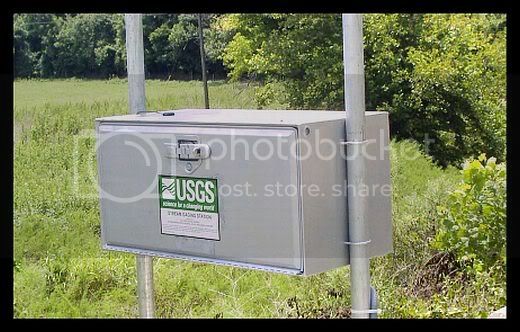 Imagine my surprise when on my way into town yesterday, I was confronted by a temporary one-lane bridge sign and a team of USGS ("men in orange") installing one of these gizmos only a few miles from my house. Politely waving to the crew as I passed by, I took notice of the fact that this looked like quite an operation, with a crane supporting a squad of five men and a team of official-looking trucks on the bridge. I made it up the road about a quarter-mile before wheeling my jeep around. Okay… I had to know what was going on. These mystifying mechanisms were getting closer to my home. That’s when I met Ben Thompson. Fresh out of the University of Arkansas in Fayetteville, on this day Ben had been assigned the job of regulating the one-lane bridge traffic with a two-sided stop sign. It was clear that he would much rather have been assisting the bridge workers installing the whatchamacallits instead of waving that sign around whenever a car passed by. Sitting in the sweltering summer heat with nothing much to do, Ben was more than happy to answer a few questions and dispel my extra-terrestrial theories. Turns out these space-age Jetson-looking boxes can perform a wide variety of tasks that will benefit the local community, as well as keep the U.S. Geological Survey organization (the USGS) well-informed via a geostationary satellite which orbits the earth ... keeping tabs on every one of these little silver information transmitters. "Technically it’s called a streamgage," Ben informs me. "Each one is equipped with a computer that monitors river level, rainfall, as well as air and water temperature every fifteen minutes . 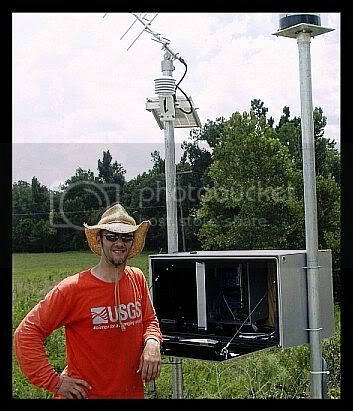 The computer sends hourly updates to the USGS website which are immediately posted on the site. In addition to the Spring River, the streamgages are installed on the Myatt and South Fork rivers ... all of which empty into the Spring River." An advanced early warning flood system may be a life-saver the next time the river roars again, as it did in September 2006, when two people near Hardy lost their lives in a flash flood. The Spring River Basin received as much as 12 inches of rain in a short period causing water in Hardy to rise 13 feet in less than 12 hours. Such devices would have been also been invaluable on the Little Missouri River in June 2010, when flood waters rose as swiftly as 8 feet an hour and claimed the lives of 20 people at a popular campground near Glenwood, Arkansas. Ben introduced me to the project's manager; Dan Wagner, a hydrologist from the Arkansas Water Science Center's Fayetteville field office . "The plan is to have the Upper Spring River Early Flood Warning System complete by October, " he adds, "which would make it possible for locals to access the information via their cell phones and home computers through the USGS website." Dan also suggests I visit the USGS website for even more details. The project actually began a few years back, Dan explains, in the wake of the September 2006 flood, when Hardy Mayor Nina Thornton, Fire Chief Lonnie Phelps and Police Chief Ernie Rose held a meeting with about 60 people in the old Hardy gym. On hand to explain how the system would work and benefit the community were Jaysson Funkhouser, a USGS surface water specialist from Little Rock, National Weather Service warning coordination meteorologist John Robinson of North Little Rock, and NWS hydrologist Steve Bays of Cabot, Arkansas. "We’d like to see everyone—the canoe rentals [owners], the campsites [owners]—all pitch in together and fund this a little bit," Hardy Police Chief Ernie Rose said at the meeting. He suggested that communities, cities, fire departments and other civil entities canvas the areas involved, asking businesses to commit to helping fund the early warning system. Fire Chief Lonnie Phelps pointed out the benefits of the proposed warning system, comparing it to the system Hardy has adopted in the past decades. "I’ll tell you what you’ve had in the past—you’ve had Ernie and I out watching the river." "If it saves only one life, it’s worth it," Mayor Thornton said. Mayor Thornton then applied for and was awarded a $125,000 grant from NOAA (National Oceanic Atmospheric Administration) for an Upper Spring River Early Flood Warning Information System after the floods of September 2006 claimed several lives and floods during March and April of 2008 caused extensive damage in the area. The grant pays for the installation and one year's operation and maintenance of the three new Upper Spring River Early Flood Warning Information System gages in the watershed (South Fork Spring River, Spring River near Mammoth Springs, and Myatt Creek gages ). Dan continues, "Each streamgage in the warning system is equipped with a powerful computer which, as soon as water reaches dangerous levels, will automatically telephone emergency rescue teams, police chiefs and others whose numbers are programmed into the gage. 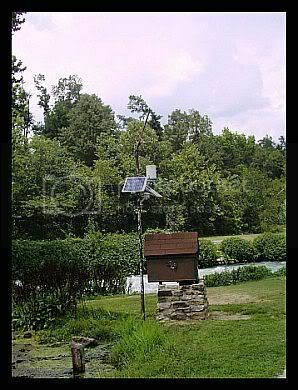 The way a typical streamflow gaging station works is by measuring gage height (river level), rain, water temperature, and air temperature information which are collected every 15 minutes, transmitted to a geosatellite once every hour, then transmitted back to our processing center in Virginia, eventually making it to our NWIS website (NWIS stands for National Water Information System)." Then he begins to lose me with a bit more technical information as he explains, "Stream discharge (volume of water flowing down the stream) is added to the data on NWIS from a stage-discharge "rating curve" that USGS maintains. The rating curve is developed by making discharge measurements across a wide range of gage heights, from low gage heights when the stream is a mere trickle to higher gage heights when the stream is at flood. Hydrologic Technicians visit streamflow gaging stations every 8 weeks and sometimes more often to verify that the gage is working properly, reading correctly, and to make discharge measurements." Wow ... I thought to myself ! I was starting to believe the alien theory myself. This was some serious space age stuff ! "In addition to the streamgage’s invaluable flood warning information," Dan elaborates, "some of the streamgages in the state also record and transmit data regarding the water quality. Whether you drink water from your tap or canoe down your local river, chances are you will benefit in some way from the USGS streamgage information. Once the new program is in place," he tells me, "a public meeting will be held in Hardy . Anyone interested is invited to attend in order to learn more about how the system works ." Ben remarks, "Perhaps if such a forewarning system had been in place on the Little Missouri River back in June, that terrible disaster could have been avoided." As I drive away, leaving the team to finish their work, I can’t help but agree. It’s good to know that the City of Hardy, as well as folks along the river, will soon be better prepared for future flash floods due to the efforts of the USGS and the initiative of some of our local officials. 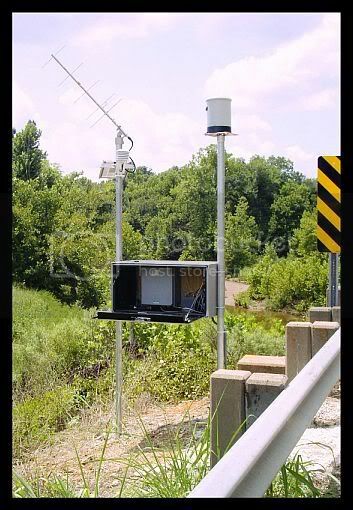 070692657 Myatt Creek north of Saddle, Arkansas"
The Spring River at Town Branch Bridge at Hardy streamflow gaging station is the first of four gages in the Upper Spring River Early Flood Warning Information System. The site sends call alerts to the local 911 office, National Weather Service, USGS, City of Hardy Police, and other emergency responders when the gage height (river level) reaches 8.0 ft at the gage. Three of the above-mentioned streamflow gaging stations will be added to the Early Flood Warning Information System, hopefully by the end of October, 2010: Spring River near Mammoth Springs, South Fork of Spring River at Saddle, and Myatt Creek north of Saddle. These sites will have call-out capabilities similar to those at the Spring River at Town Branch Bridge at Hardy station. 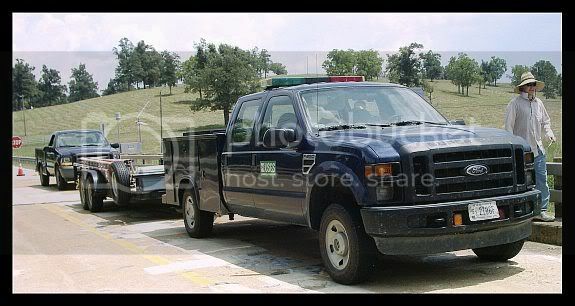 In 2006, the city of Hardy only had 20 to 30 minutes to evacuate low-lying areas. However, with the newly-installed Early Flood Warning System in place and operating, that time frame could increase to two to three hours’ evacuation time, allowing everyone to safely move to higher ground. "Water is probably the most important commodity for the nation. It’s one that’s under appreciated but it’s essential for life, as we know. None of us can get by within a day or two without drinking it. And so, knowing how much water is available in our rivers and our streams is critical for the national health. And using our streamgages, we can monitor that flow in rivers and know how much water is available. It’s critically important as we go into the future and uncertain climate, as climate change affects the availability of water in rivers and streams around the country." NOW FOR THE OTHERSIDE OF THE COIN ... the following article also appeared in the JULY 28, 2010 Issue of SRSG mag ... it is probably one of the most locally oreinted interviews I have ever done. Special thanx goes out to JODY SHACKLEFORED FOR MAKING THIS HAPPEN !